WOWWW!! 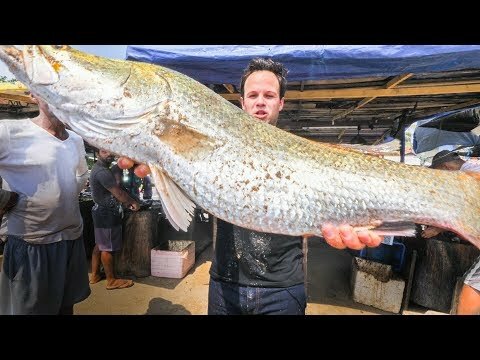 We found INSANE Seafood in Sri Lanka! This MASSIVE Seafood Fish Market and home cooked FISH CURRY was HEAVEN! Sri Lanka has some AMAZING Seafood, and today, we’re bringing YOU to the local fish market to pull in a HEAVY net of Sri Lankan seafood and bring it to our local friends home for a HUGE Home Cooked FEAST! In Southern Sri Lanka, in Galle, we’re bringing you to the local fish market and street food area to pull in a HUGE fishing net with the local fishermen. We’re showing you how catching fish is done every day for the local fishermen and seafood vendors here in Galle, and also showing you the fish cutting! Sri Lanka has some of the BEST Street Food in the world! Today, we’re buying a MASSIVE fish from the fish market in Galle, Sri Lanka, and then bringing it to the fish cutting station to chop up into massive steak like chunks and bring to our local friends home to cook into a CREAMY and slightly SPICY fish CURRY! The fish curry is prepared 2 ways, the first is the body and is in a mustardy and slightly sour and peppery broth, and the second way is a fish head curry that is quite creamy with home made coconut milk. There were quite a few fish in the net when we pulled it in at this local fish market in Galle. The famous fish are the pariah fish and the big “malet” fish as the locals called it. All of these fish can either be cooked up Sri Lankan style or also BBQ on one of the many restaurants found on the street side in Galle.